Well team Moon Gazer were righty chuffed last week as we came away as winners in one of the region’s top food and drinks awards – The EDP EatNorfolk Food and Drink awards 2018. Bruce and Shane attended the prestigious awards at the Open, in Norwich – an event which was a fabulous showcase of all the best that Norfolk’s artisan producers and retailers have to offer. 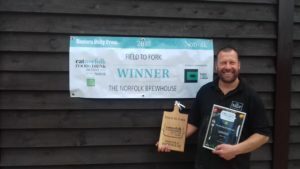 We had been fortunate enough to become finalist in two of the award categories – firstly for the Pride of Norfolk award and then for the Field to Fork award. On the night we were announced as the winners of the Field to Fork category, for our work with Norfolk barley growers and the maltsters Crisp Maltings. We are proud unofficial ambassadors for Norfolk barley and in particular Maris Otter and devote a lot of time and effort wherever we can in spreading the virtues of the malt. Norfolk barley is sort after from top brewers all over the world and indeed Maris Otter is exported to 20 countries – true testament of its quality. For our part we are thrilled to be recognised for the work that we do and in turn the recognition that gave to the hardworking farmers and growers in the county.